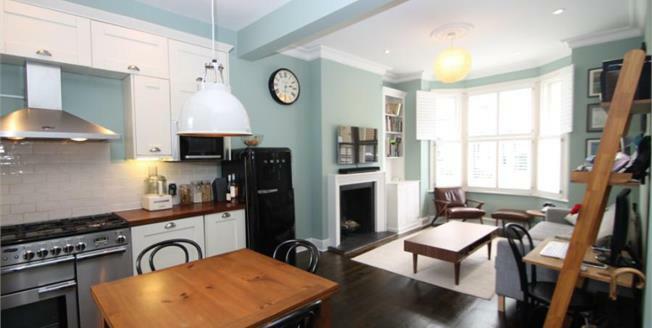 Situated on the ground and first floors of this attractive converted period property , this beautifully presented apartment offers a bright and spacious living space in a superb location only moments from Clapham Junction. The apartment comprises of a substantial reception room opening on a well designed kitchen with space for a large table to dine, two double bedrooms with an en-suite to the master bedroom and a splendid private rear garden Furthermore more the planning permisson to convert the basement. Sangora Road will place you within easy reach of many trending hotspots including Wandsworth Common, the bars in Battersea Rise and Northcote Road, the popular eateries in Lavender Hill and the exclusive wine bars that St. Johns Hill has to offer. Of great benefit to the commuter is Clapham Junction being just a short distance away. Radiator. Wall and base units, belfast style sink, integrated, gas, double, microwave oven, integrated, gas hob, over hob extractor, space for dishwasher, space for fridge/freezer. French , opening onto the garden. Radiator. Heated towel rail. High level flush WC, panelled bath, pedestal sink. Heated towel rail. Low flush WC, single enclosure shower, vanity unit and wash hand basin.